If you currently smoke then there's never been a better time to quit than right now! Tobacco use has become very expensive in today's world, but an even more concerning aspect of smoking is the health consequences that come with it. Smoking CAN be beat though, and many have done just that, so don't give up hope just yet. 1 Centers for Disease Control and Prevention. Current Cigarette Smoking Among Adults—United States, 2005–2013. Morbidity and Mortality Weekly Report 2014;63(47):1108–12 [accessed 2015 June 1]. 2 U.S. Department of Health and Human Services. The Health Consequences of Smoking—50 Years of Progress: A Report of the Surgeon General.Atlanta: U.S. Department of Health and Human Services, Centers for Disease Control and Prevention, National Center for Chronic Disease Prevention and Health Promotion, Office on Smoking and Health, 2014 [accessed 2015 June 1]. 3 Jha P, Ramasundarahettige C, Landsman V, et al. 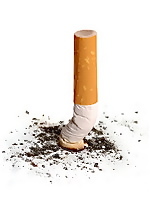 21st Century Hazards of Smoking and Benefits of Cessation in the United States. New England Journal of Medicine 2013;368:341–50. 4 American Lung Association. Smoking Cessation: The Economic Benefits - All U.S. States Facts. Available: http://www.lung.org/stop-smoking/tobacco-control-advocacy/reports-resources/cessation-economic-benefits/states/united-states.html. Accessed 2015 June 1. 5 Xu X, Bishop EE, Kennedy SM, Simpson SA, Pechacek TF. Annual Healthcare Spending Attributable to Cigarette Smoking: An Update. American Journal of Preventive Medicine 2014;48(3):326–33. 6 Survey shows how depression and smoking intertwine. Reuters. By Maggie Fox, Health and Science Editor. Wed Apr 14, 2010.